Diffuse alveolar hemorrhage (DAH) is rare and potentially fatal. Multilobar pneumonia can simulate DAH both clinically and radiographically. Recognition of DAH is of utmost importance as the diagnostic work-up and treatment differ from pneumonia. We provide a case to illustrate this point as well as discuss the etiology, diagnosis and treatment of DAH. Tiana R Endicott-Yazdani, Steven Gannon and Adan Mora, Jr. have no conflicts of interest to disclose in relation to this article. Double-blind peer review. Compliance with Ethics : Written informed consent was not obtained from the patient case included in this report as they were lost to follow-up; no identifying information or images have been used. Diffuse alveolar hemorrhage (DAH), though rare, can be fatal and requires a high index of suspicion as frank hemoptysis may not be a presenting symptom. Multilobar pneumonia can simulate DAH both clinically and radiographically. Diagnosis relies on a strong clinical suspicion, laboratory studies, imaging, and pathology. Overall incidence of DAH is difficult to estimate as it is usually a complication of another disease entity. Due to the high mortality a high degree of suspicion is required and early interventions are necessary. Flexible bronchoscopy with serial bronchoalveolar lavage is the preferred method to identify DAH and exclude infection, eosinophilia, and malignancy. Once diagnosis of DAH has been made, or even if highly suspected, laboratory evaluation should be initiated which may help identify the specific etiology. Diffuse alveolar hemorrhage (DAH), though rare, can be fatal and requires a high index of suspicion as frank hemoptysis may not be a presenting symptom. For a patient in which bilateral pulmonary infiltrates are present, DAH should be in the differential as additional diagnostic evaluations and different treatment is mandated. We present a case of delayed recognition of DAH, initially thought to be a multilobar pneumonia. A 67-year-old woman, without any significant past medical history, presented to the emergency department with a 1-day history of low-grade fever, cough, and malaise. She had recently been in contact with a relative who was hospitalized with pneumonia. On examination, her temperature was 100.6°F, heart rate was 98, blood pressure 134/86, respiratory rate 22, and oxygen saturation on room air was 89%. Her only notable exam finding was faint bilateral crackles in the posterior lung fields. 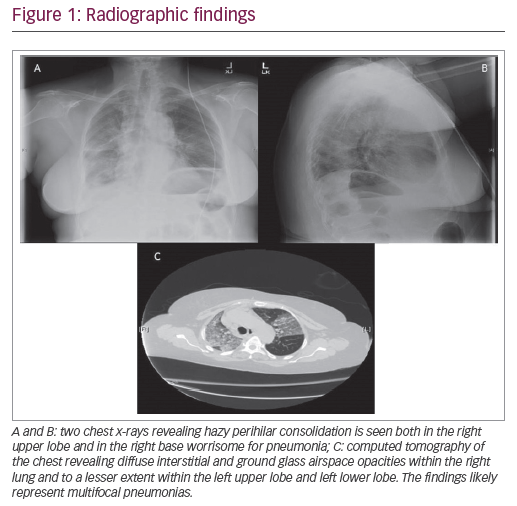 A chest x-ray revealed hazy perihilar consolidation in both the right upper lobe and right base, worrisome for pneumonia (Figure 1A and B). Her initial white blood cell count was 9.7 K/µL without bands or neutrophil predominance. Her hemoglobin was 13.6 g/dL, and creatinine was 0.53 mg/dL. She was admitted to the general medicine ward and started on antibiotics (ceftriaxone and azithromycin) for community acquired pneumonia. The following day, her oxygen requirement continued to increase and she required a 60% large-reservoir oxygen mask to keep her oxygen saturation >92%. A chest computed tomography (CT) scan was ordered, which revealed diffuse interstitial and ground glass airspace opacities within the right lung, lesser extent within the left upper lobe and left lower lobe. The findings likely represent multifocal pneumonias (Figure 1C). Due to continued deterioration the patient’s case was transferred from the hospitalist to the intensivist in the intensive care unit (ICU) when she required a 100% non-rebreather mask. She was intubated immediately and placed on mechanical ventilation. Due to her rapid decline in respiratory status and failure to respond to appropriate antibiotics, a bronchoscopy with bronchoalveolar lavage (BAL) was performed of the bilateral lower lobes with serial aliquots to evaluate for hemorrhage, eosinophils, the airways, and infectious pathogens. In the right lower lobe her red blood cell counts were 1) 50 K/µL; 2) 70 K/µL; and 3) 79 K/µL. In the left lower lobe her red blood cell counts were 1) 19 K/µL; 2) 30 K/µL; and 3) 80 K/µL. She was started on methylprednisolone 500 mg intravenously every 12 hours given that the BAL findings were consistent with DAH. Within 3 days, the patient improved to the point that she was extubated and placed on nasal cannula, and was subsequently discharged from the ICU. Her evaluation was extensive (Table 1) and only significant for a positive cyclic citrullinated peptide antibody 16 U/mL (negative <7), autoantibody to U1 snRNP 6.2 (negative <1.0), and autoantibody to Smith 1.5 (negative <1.5). All blood cultures were negative at 5 days and all respiratory cultures were negative at 8 weeks. The patient was discharged after 13 days in the hospital and instructed to follow up for further evaluation with rheumatology, given findings concerning for an underlying rheumatologic etiology of her DAH. Additionally, she was instructed to continue immunosuppressive therapy. DAH is a rare but serious condition that can quickly lead to death. Diagnosis relies on a strong clinical suspicion, laboratory studies, imaging and pathology. Over 100 different causes of DAH have been identified; however, the etiologies can be divided into three broad categories.1 For the sake of simplicity we will use a slight variation of the categorization of DAH etiologies as described by Thomas et al. and Albelda et al. : renal disease associated, immune complex associated, and disease associated with neither.2,3 The most common renal causes of DAH include those in which anti-glomerular basement membrane antibodies are present such as Goodpasture syndrome, coagulopathy from end-stage renal disease uremia, and idiopathic concentric glomerulonephritis. Common immune complex associated causes of DAH include systemic lupus erythematous, granulomatosis with polyangiitis, cryoglobulinemia, Henoch-Schonlein purpura, mixed connective-tissue disease, and other vasculitic processes. Common causes of DAH not associated with renal disease or immune complex disease include acute respiratory distress syndrome, idiopathic pulmonary hemosiderosis, bleeding disorders, toxins, medications, trauma, congestive heart failure, malignancy, and pulmonary venous hypertension. Mortality can be quite high in DAH with reports ranging between 20–50% while in the hospital.1 Mortality was found to be 60% in patients with DAH from granulomatosis with polyangiitis, the most common cause of DAH.5 One study evaluating microscopic polyangiitis found that up to 30% of patients die during the acute hemorrhage, and in those who survived, the 1-year and 5-year survival was 82% and 68%, respectively.6 Additionally, patients who develop DAH rarely have it in isolation and it is usually the result of an ongoing systemic disease. However, there have been case reports of isolated pulmonary capillaritis and DAH in rheumatoid arthritis and mixed connective tissue disease as seen with our patient.7 Diagnosis of rheumatologic conditions presents a unique set of challenges as disease processes frequently overlap and clinicians rely heavily on antibody panels. Ultimately, survival of DAH is based on the severity of the pulmonary hemorrhage and response to treatment of the underlying cause. Due to the high mortality, a high degree of suspicion is required and early interventions are necessary. However, treatments should be directed at the suspected or known etiology if possible. If infection is suspected antibiotics should be initiated early. For DAH thought to be secondary to an autoimmune etiology, immunosuppression and corticosteroids are first-line treatments. Plasmapheresis should be used in patients with immunoglobulin or immune complex disease—specifically Goodpasture syndrome. DAH should be considered in patients with diffuse radiographic opacities, abnormal gas exchange, and hemoptysis. It is important to note hemoptysis may be absent in up to 33% of patients with DAH.8 Regardless of presence of hemoptysis, suspicion for DAH should be high in patients with progressive respiratory symptoms and ground glass or consolidative opacities on imaging, especially when associated with a drop in the patient’s hemoglobin. While DAH was not initially considered in our patient, her failure to respond to traditional treatment led to re-evaluation of the etiologies of her illness upon transfer to the ICU, and prompted bronchoscopic evaluation. This case emphasizes the importance of keeping differential diagnoses broad, especially when patients fail to respond to treatment. In our case, the patient was diagnosed with multilobar pneumonia, which in most instances, would have been appropriate; however, failure to challenge the etiology of her disease could have led to tragic consequences. Multilobar pneumonia and DAH may present with similar clinical and radiographic characteristics. In the appropriate setting, pneumonias may be associated with increased alveolar bleeding if the pneumonic burden is high. However, it is important to recognize when pulmonary infiltrates, with or without infection, have a presentation of DAH, as the treatment is to provide what may essentially be lifesaving immunosuppression. Additionally, the etiology must be evaluated and addressed as DAH may be a problem, but not the diagnosis. Again, a high index of suspicion is required and immediate immunosuppression may be of utmost importance. de Prost N, Parrot A, Cuquemelle E, et al. Diffuse alveolar hemorrhage in immunocompetent patients: etiologies and prognosis revisited. Resp Med. 2012;106:1021–32. Thomas HM, Irwin RS. Classification of diffuse intrapulmonary hemorrhage. CHEST. 1975;68:483–4. Albelda SM, Gefter WB, Epstein DM, Miller WT. Diffuse pulmonary hemorrhage: a review and classification. Radiology. 1985;154:289–97. Travis WD, Colby TV, Lombard C, Carpenter HA. A clinicopathologic study of 34 cases of diffuse pulmonary hemorrhage with lung biopsy confirmation. Am J Surg Pathol. 1990;14:1112–5. Green RJ, Ruoss SJ, Kraft SA, et al. Pulmonary capillaritis and alveolar hemorrhage. Update on diagnosis and management. CHEST. 1996;110:1305–16. Lara AR, Schwarz MI. Diffuse alveolar hemorrhage. CHEST. 2010;137:1164–71. Schwartz MI, Zamora M, Hodges TN, et al. Isolated pulmonary capillaritis and diffuse alveolar hemorrhage in rheumatoid arthritis and mixed connective tissue disease. CHEST. 1998;113:1609–15. Park MS. Diffuse alveolar hemorrhage. Tuberc Respir Dis (Seoul). 2013;74:151–62. Greening AP, Hughes JM. Serial estimations of carbon monoxide diffusing capacity in intrapulmonary haemorrhage. Clin Sci (Lond). 1981;60:507–12. De Lassence A, Fleury-Feith J, Escudier E, et al. Alveolar hemorrhage. Diagnostic criteria and results in 194 immunocompromised hosts. Am J Respir Crit Care Med. 1995;151:157–63. Lauque D, Cadranel J, Lazor R, et al. Microscopic polyangiitis with alveolar hemorrhage. A study of 29 cases and review of the literature. Groupe d’Etudes et de Recherche sur les Maladies “Orphelines” Pulmonaires (GERM”O”P). Medicine (Baltimore). 2000;79:222–33. Myers JL, Katzenstein AA. Microangiitis in lupus-induced pulmonary hemorrhage. Am J Clin Pathol. 1986;85:552–6. Abrams D, Agerstrand CL, Biscotti M, et al. Extracorporeal membrane oxygenation in the management of diffuse alveolar hemorrhage. ASAIO J. 2015;61:216–8. Stone JH, Merkel PA, Spiera R, et al. Rituximab versus cyclophosphamide for ANCA-associated vasculitis. N Engl J Med. 2010;363:221–32. Jones RB, Furuta S, Tervaert JW, et al. Rituximab versus cyclophosphamide in ANCA-associated renal vasculitis: 2-year results of a randomised trial. Ann Rheum Dis. 2015;74:1178–82. Gómez-Puerta JA, Hernández-Rodríguez J, López-Soto A, Bosch X. Antineutrophil cytoplasmic antibody-associated vasculitides and respiratory disease. CHEST. 2009;136:1101–11. Levy JB, Turner AN, Rees AJ, Pusey CD. Long-term outcome of anti-glomerular basement membrane antibody disease treated with plasma exchange and immunosuppression. Ann Intern Med. 2001;134:1033–42.